Thanks to all at QMS for their invaluable assistance during the upgrade. 2019 marks our 40th Birthday! It doesn't seem it, but 2019 marks our 40th Birthday. A huge thanks to all our Customers, Suppliers and Employees, some of which we have been with for the entire 4 decades. 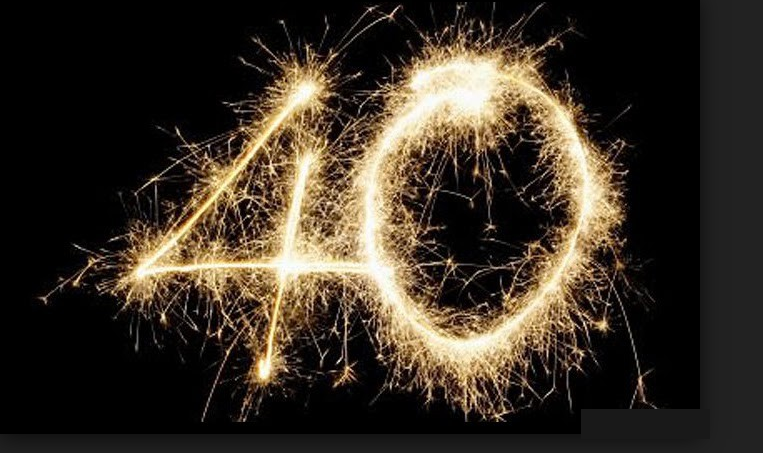 Here's to the next 40! 26 February 2016. 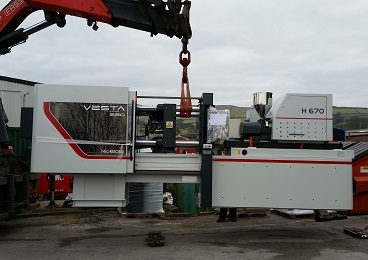 Today saw the delivery of our new Negri Bossi VE220 Injection Moulding Machine. This is a 220 tonne all electric machine designed for maximum energy efficiency. The machine will commence production early March. The delivery went smoothly although our car park was blocked for a couple of hours. Thanks to all our neighbours for being so understanding. We are investing in our business. Over the past few months, we've been busy working behind the scenes with our strategic marketing consultants and a creative agency to take Dickinson Philips to the next stage of growth. 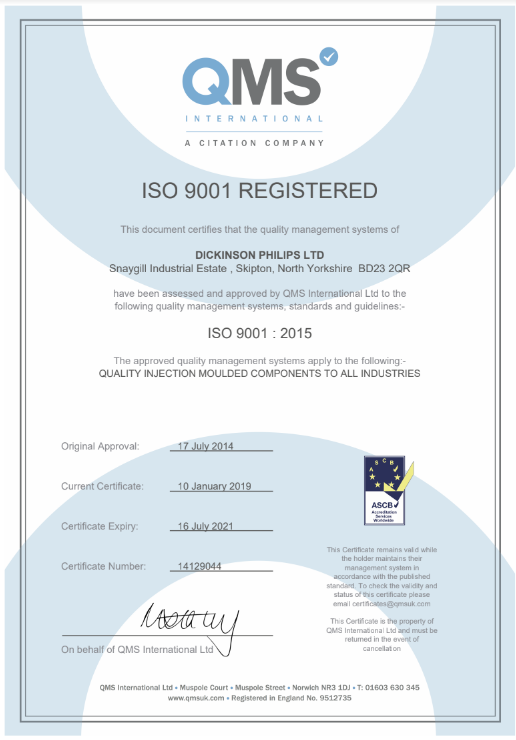 We're very proud to present our new brand and website and look forward to building our position as a major supplier of plastic injection moulded products and toolmaking services, for an expanding UK wide customer base that values manufacturing and service excellence. We hope you like our new look! Dave Smith, our General Manager attended the Negri Bossi Golf Day in June. After a glorious day of golf, he came second overall. Simon and John would like to thank everyone at Negri Bossi for their continuing support and promise Dave will try harder next year! Negri Bossi was founded in the UK in 1955 and is one of the world's foremost suppliers of injection moulding machines. 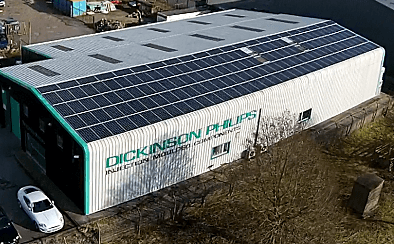 Dickinson Philips is proud to enjoy a close and long-standing relationship with the company. 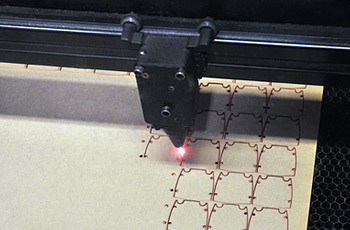 September - We are pleased to announce our Laser Cutting & Engraving Facility. This gives our customers added options for prototyping and low volume production prior to tooling up for injection moulding. We are delighted at the interest shown from our existing customers. September saw our Solar Power production reach 135,000kWh, saving over 140 tonnes of CO2 emissions since installation. Not only does this help the environment, but the energy cost savings give us a competitive edge with production costs.